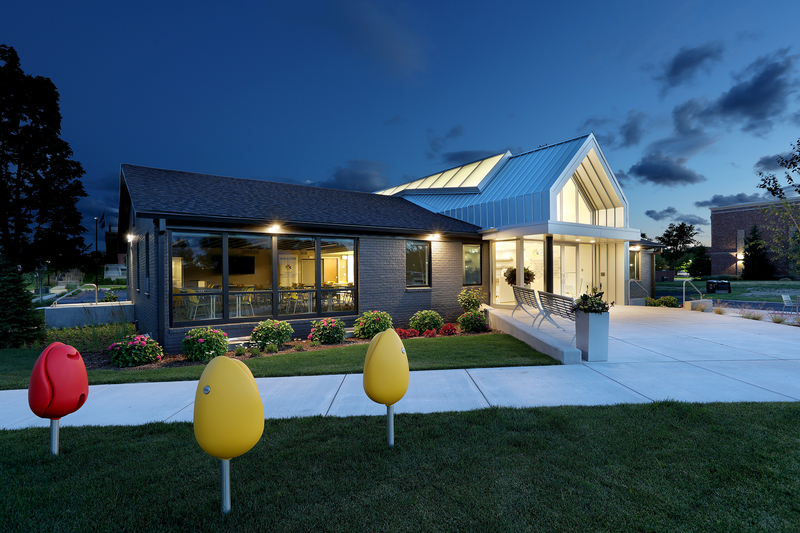 Holland, MI April 8, 2019—Lakewood Construction’s work on the West Coast Chamber of Commerce in Holland, MI has earned a National Excellence in Construction® Eagle Award from Associated Builders and Contractors in the category of Renovation—Less than $5 Million. 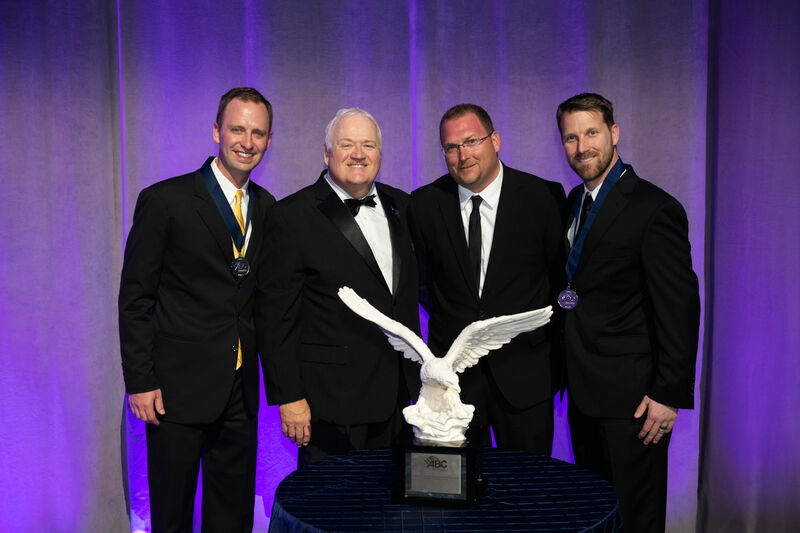 Representatives from the company received the top honor March 27 during ABC’s 29th annual Excellence in Construction® Awards gala at ABC Convention 2019 in Long Beach, California. The West Coast Chamber serves as the heart and backbone of the Holland and Zeeland community. Their 7,300-square-foot office (the building was originally constructed in 1972 and has been home to the Chamber since 1987) was in serious need of repair and no longer epitomized a welcome that reflected the essence of this vibrant lakeside community. Engaging with a range of stakeholders, Chamber staff and the broader community made the project unique by synthesizing a wealth of ideas for creating a cohesive design solution. Solving the space needs of the Chamber while providing a visual impact on a modest budget would be a challenge. During the planning stages, the wish list was long: a new atrium and spine (a vaulted roofline that splits into the existing building), new learning center, bathrooms, mechanical upgrades, office renovations, and exterior upgrades and improvements. Now complete, new features in the building include a flexible Learning Lab meeting space that can accommodate up to 65 people for in-house events, an additional conference room, state-of-the-art technology for meeting space and staff efficiency, collaborative office space for Chamber staff, and ample space for visitor parking. 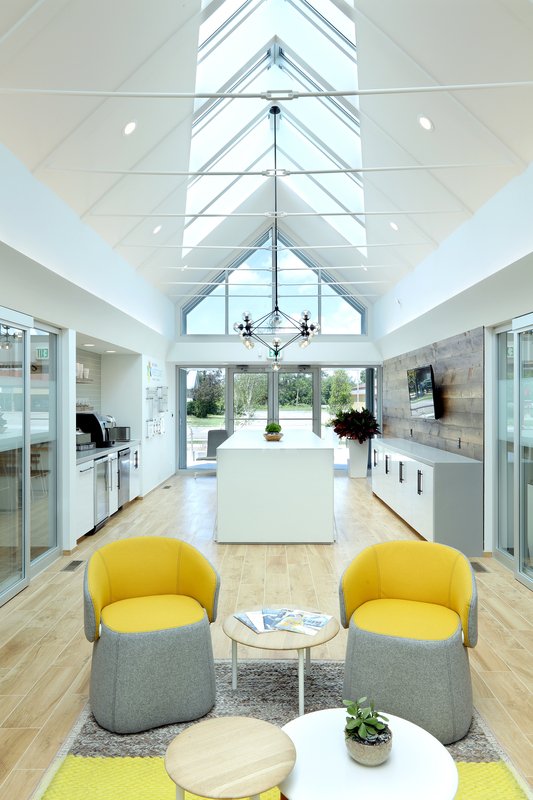 The most striking feature of the building inside and out is the brilliant, light-infused atrium during the day and a lantern of light at night and serves as the symbolic and literal entrance to the bustling city of Holland. The facility also hosts a new outdoor patio space equipped with wi-fi, as well as being connected to downtown Holland’s signature snow-melt system. The results are a bright, modern building that meets the West Coast Chamber’s needs with unique finishes like the an amazing sculpted wall in one of the conference rooms, the tulip seats located in the front lawn, an outdoor learning lab, and the amazing spandrel glass spine that lights up the entire building—interior light in the day and a beacon of light for the community at night. Lakewood Construction was founded in 1971 as a general contracting company specializing in commercial and industrial projects. Today, Lakewood services include Pre-Construction Services, Construction Management, Design|Build, and Real Estate Development services for healthcare, commercial, educational, and industrial clients throughout West Michigan. Lakewood is a National and a West Michigan Best & Brightest Company and has consistently been an Associated Builders & Contractors/West Michigan (ABC/WMC) Excellence in Construction award-winning firm. For more information, visit lakewoodinc.com.